Bruce Springsteen began working as a professional musician and performer more than 40 years ago, but for over a decade prior to that he was developing his talent, most crucially by listening to the records that would not just infuse his mind and body, but which would equally provide the guidance, inspiration and encouragement to achieve the extraordinary skills he has been honing to perfection in songwriting, musicianship and performance ever since. 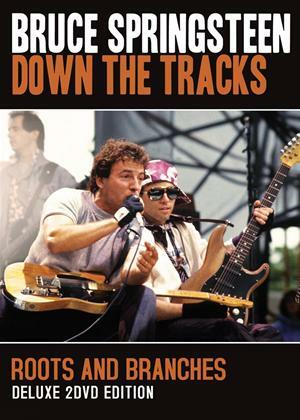 This 2 DVD set traces the musical roots of Bruce Springsteen in a manner no documentaries have ever attempted before, and in so doing shows the incredible influence the likes of Chuck Berry, Elvis Presley, Woody Guthrie, Johnny Cash, Mitch Ryder, Van Morrison, Phil Spector, Pete Seeger and numerous others have had upon his muse. The film also looks at his literary, political and other influences to provide a complete picture of the most potent inspirations Bruce ever stumbled upon. DISC ONE is a documentary film featuring rare footage of Springsteen and all of the featured artists, plus revealing archive interviews with The Boss himself, and brand new contributions from former E Street Band member Vini Lopez, Springsteen drummer Gary Mallaber, the legendary Gary U.S. Bonds, History Professor and Folk Music expert Ronald D. Cohen, English Professor and author of It Ain't No Sin to be Glad You're Alive: The Promise of Bruce Springsteen, Eric Alterman, former editor-in-chief of Rolling Stone magazine Anthony De Curtis, British music author and biographer of Van Morrison, Johnny Rogan and many other colleagues, writers and historians. DISC TWO reveals Bruce's own thoughts and comments on the music he has loved and been informed by most strongly and features numerous video interviews with The Boss recorded at various points across his career, during which we hear straight from the horse's mouth how it was that a young man from small town New Jersey turned the art of listening to records into the art of performing and creating his own remarkable music.